Does the Journal speculate to simply draw itself a crowd? “A lot of the heavy lifting has been done,” says Kansas City Fed President Esther George. The S&P was up 22; and the Nasdaq, a thumping 91 points. If a lot of the heavy lifting has been done, as Ms. George suggests… how strong are the arms doing the lifting? The Federal Reserve worked its balance sheet from a pre-crisis $800 billion to roughly $4.5 trillion. Quantitative tightening began in October 2017. How much has it run off to date? Some $400 billion — about 10% of the post-crisis onslaught. The autopilot was set to some $50 billion of monthly drawdowns this year — $600 billion by year’s end. But his comments tripped the warning bells, and the red lights began flashing. Markets spiraled on his words… like an airliner that’s lost a wing. And stocks came within a whisker of a bear market by Christmas. Of course, the Federal Reserve said QT would have no market impact. Like “watching paint dry,” was the specific analogue. But was it coincidence the stock market suffered its worst year since 2008, shortly after QT’s onset? By early this month he was whistling a different, much sweeter melody. At a Jan. 4 meeting of the American Economic Association Powell claimed the Fed would be “listening carefully” to markets. And as if by the magician’s wand… the Dow Jones climbed 400 points in the hours following the remarks. Stocks have remained under the white magic three weeks running. The Federal Reserve has long desired to return the balance sheet to “normal” — an aspiration reinforced by Powell’s November comments. But what is “normal”? And how would they know? Is it the pre-crisis $800 billion? Perhaps $1 trillion? 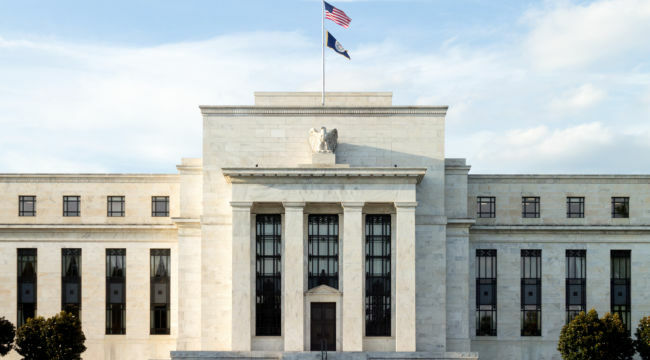 By its own telling, the Federal Reserve ranges it anywhere between $1.5 trillion and $3 trillion — still pretty handsome. Well then, friends and countrymen, the balance sheet may remain abnormal for the duration, down to the last chapter. This Guha fellow expects the Fed to halt at roughly $3.5 trillion — $500 billion above the highest official estimates. The Federal Reserve will never truly “normalize” its balance sheet — despite all gabble to the contrary. Wall Street will simply not allow it. But will it be enough to keep the show going? In June 1936, the Federal Reserve decided to start its own version of QT after years of accommodation. It was time to return to “normal”… as it is today. Could not these words describe these past few years? The Dow Jones peaked in February 1937 — 10 months after the business began. It proceeded to drop some 10% over the next four months. It then found its legs for one month. The next two months it spent upon a seesaw — up and down, down and up. Then down — and how. The Dow Jones plunged nearly 50% the following eight months. It spent the next 8.5 years shoveling out. The Federal Reserve began QT in October 2017. The Dow Jones peaked last Oct. 3 — not quite one year later. Not 1937’s 10 months — but within hailing distance. The market proceeded to sink nearly 20% early October–December. The fall was steeper than 1937, but perhaps one month less in duration. Let us go ahead and declare a draw. But as in 1937, the Dow Jones has recovered this past month after its extended swoon. Will the markets oscillate for the next two month… and then proceed to plummet nearly 50% for the following eight months? So far the Dow is repeating the path of 1937, and this recent rally may be only a bear market trap for investors. It is a reminder to be cautious as 1937 shows just how quickly things can deteriorate as the Dow Jones industrial average dropped by almost 50% in eight months because of the Fed policy being caught. We have no idea if history will repeat — or even rhyme. The Federal Reserve only reopened its medical bag of easy money in 1938 — after the damage. Perhaps the dovish new QT comments will knock markets off 1937’s course. But only the gods know. And they are silent.